Disclaimer: The conclusion given at the end has been given in a completely non-professional capacity. So please take it as such. Since this is not intended to be professional investment advice, we cannot be held liable in any way. AMD gave its quarterly report and it seems that CEO Rory Read came through with what he said because after a loss of 63 Cents a Share (473 Million Dollars), AMD turned around a profit of 12 Cents per Share (89 Million Dollars) from the 2X13 period. AMD Turnsabout Profit, Revenue Increment thought to be Unstable but Holding for the time being. Keeping it as simple as possible, AMD reported a total Revenue of 1.59 Billion ( 1.19 Bil for 2X13) and a Total Profit of 89 Million. After adjusting for equity, the final profit was about 6 Cents per share. Interestingly analysts had foretasted AMD to make a net (adjusted ) profit of 5 Cents per share. 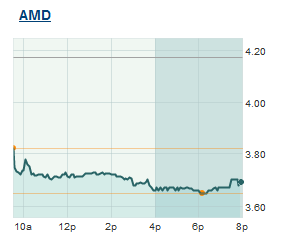 For investors should now see a +0.27% change in AMD’s share. Anyways, financial Jargon aside the Quarterly update reveals alot about the future of AMD. Interestingly AMD shares went down by 10% immediately after the report was made public. The problem is that the compute side of AMD’s business is in shambles. Compared to the fiscal year of 2012 where AMD’s compute (Processors) side was responsible for bringing in a revenue of 4005 Million Dolalrs, in 2X13 it dropped drastically to 3104 Million Dollars. On the other hand, the graphics portion increased from 1417 Million Dollars in 2X12 to 2193 in 2X13. What does that show? Basically it means that AMD are doing something very wrong where their processors are concerned and very right in the graphics department. There are multiple reasons for the the boom in their graphics department. One of course is Litecoin. Bitcoin miners have mostly shifted to ASIC but Litecoin does not allow ASIC and so users can only mine on a GPU. Seeing that Nvidia GPUs are abysmal in hashing, AMD enjoys a perfect monopoly. The other reason is of course, that both Next Gen consoles are powered by AMD GPUs. Now finally the standalone APU portion (consoles not counted). AMD seems to be doing very bad currently but we may just see a turn around thanks to Kaveri. Verdict: Here is what i think, If you are interested in investing, i would recommend against it. I expect AMD’s profit and revenue to fall by Next Quarter seeing that consoles sales will have dried off. And unless and until AMD does something drastic about its core (Steamroller) its not going anywhere either.